Vintage and romantic looks? Bring them our way! 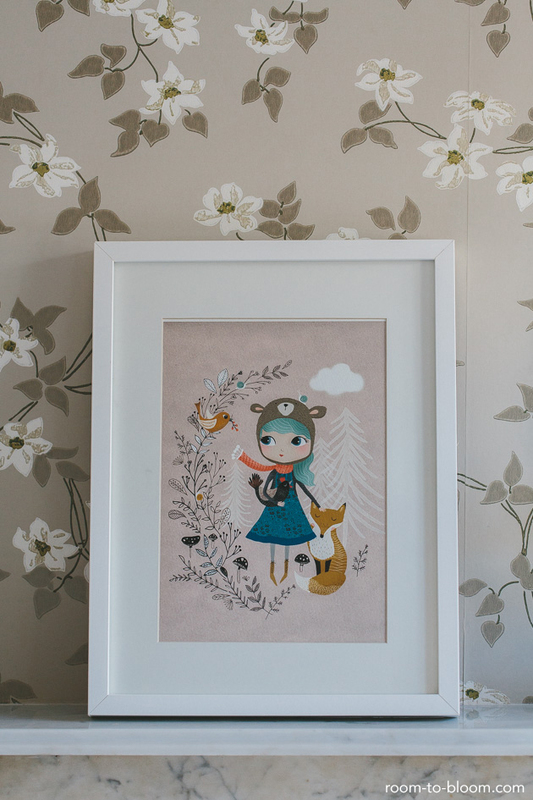 If you love to daydream you might really enjoy this children’s room’s bucolic decoration by Ursula from Room to Bloom. 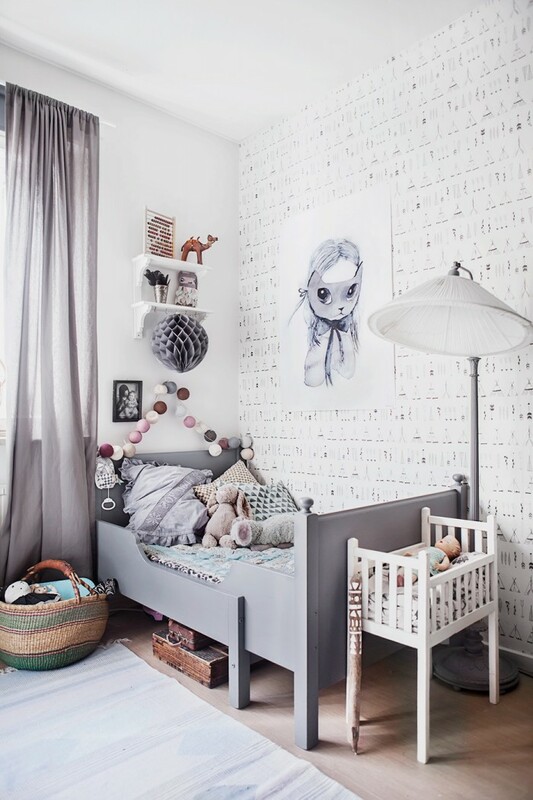 For this girl’s room, she opted for a soft grey-based style with pink and vintage accents. 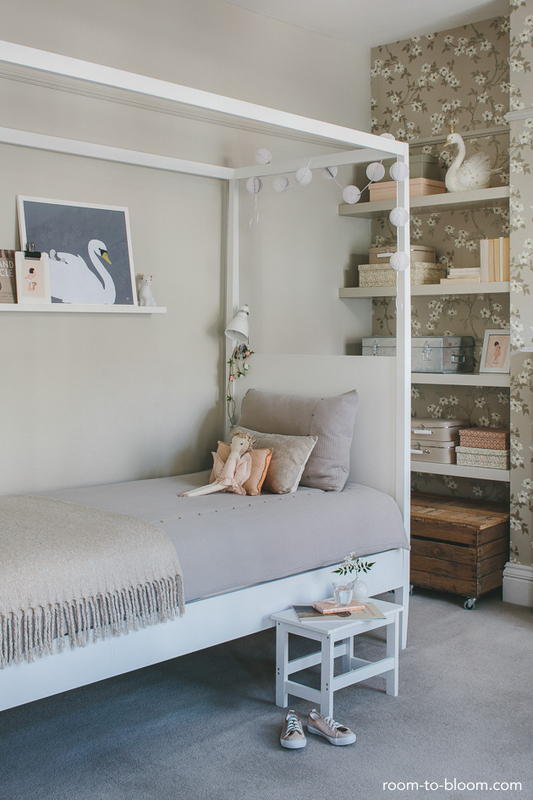 We love the combination of colours, wallpaper and pretty furniture pieces she has put together in one single children’s room. 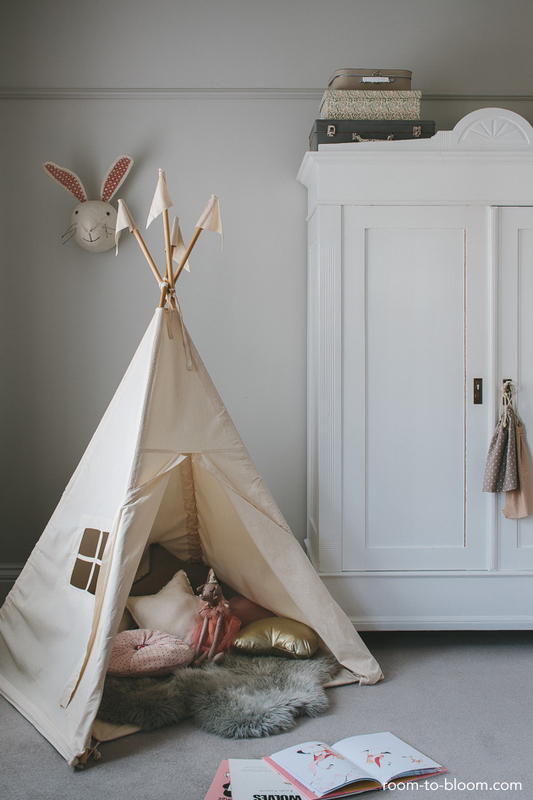 Most of the furniture is white, but Ursula added warmth with some natural timber and lots of sweet décor accessories: fairy lights, a sheepskin rug, some prints and beautiful handmade dolls. 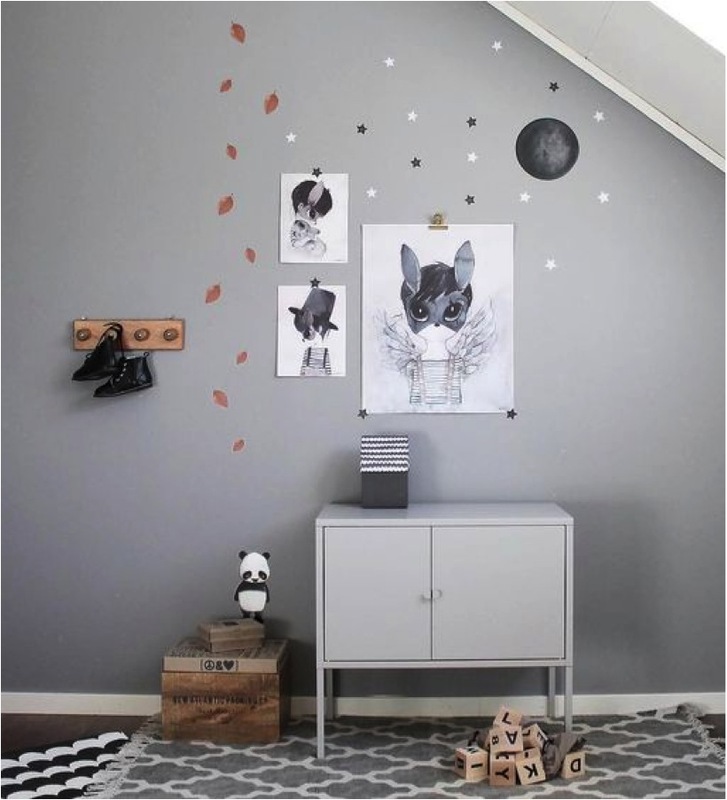 Room to Bloom is showing us in detail all the great corners in this romantic children’s room. 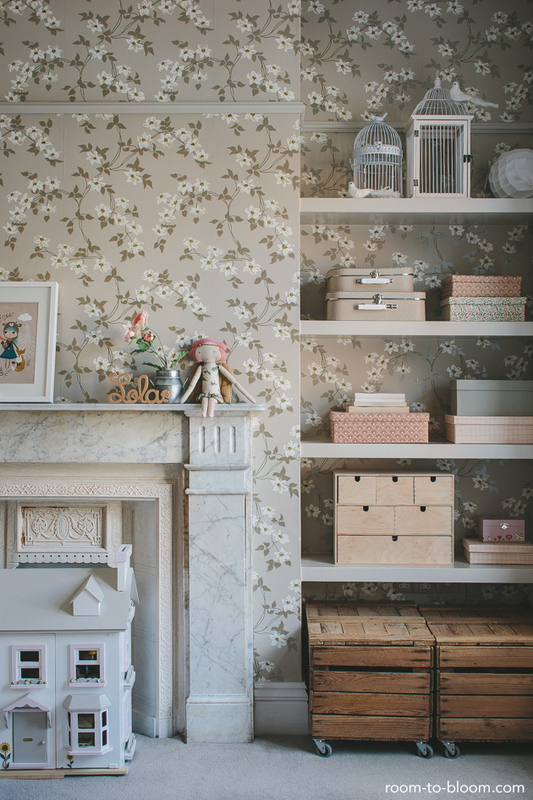 They have wisely selected this gorgeous children’s wallpaper in beige and brown shades, but there are many more interesting things we’ve spotted. 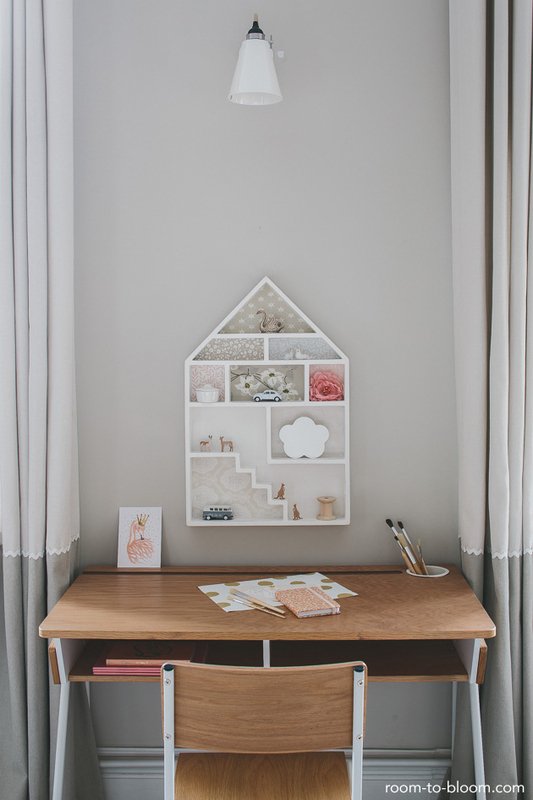 Our favourite: the adorable play corner. 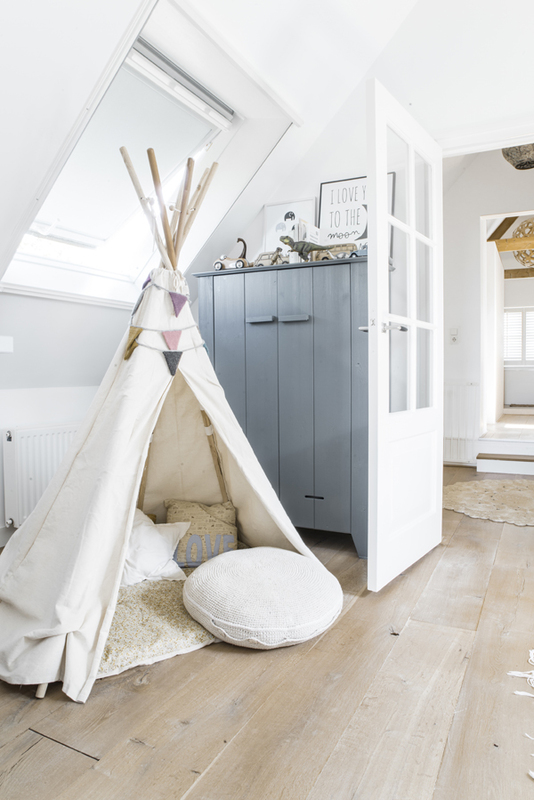 It features some DIY wooden boxes for toy storage (they’re vintage apple crates on castors) and a teepee which could become the new favourite reading nook. 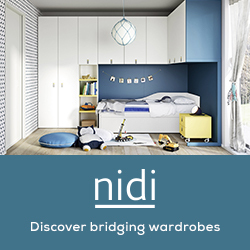 Another must in children’s rooms is the study corner, an increasingly important component. 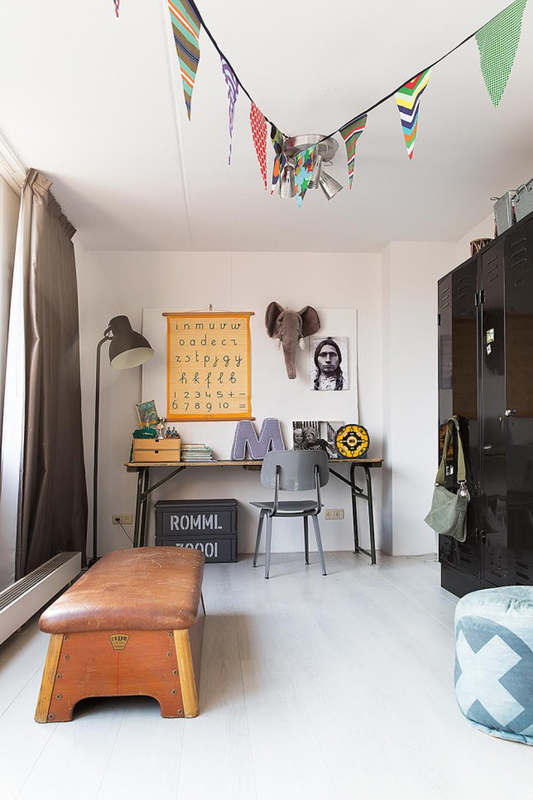 There are plenty of ideas to decorate a room with children’s desks – also vintage inspired. In this case, the choice is a vintage school desk with a matching chair. The highlight is a house shaped trinket shelf with its different wallpaper lining. Ursula has created a snug nook for bedtime. 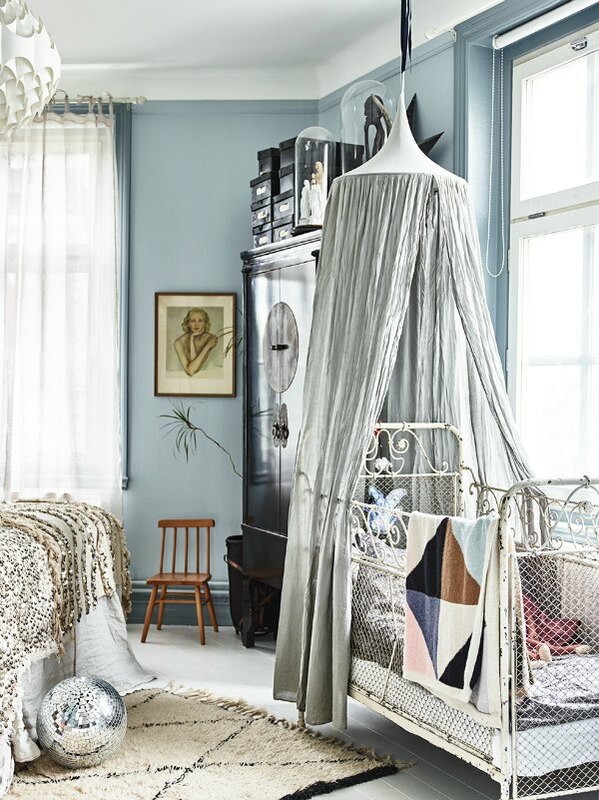 She chose a four poster bed and some bedding from Camomile London. 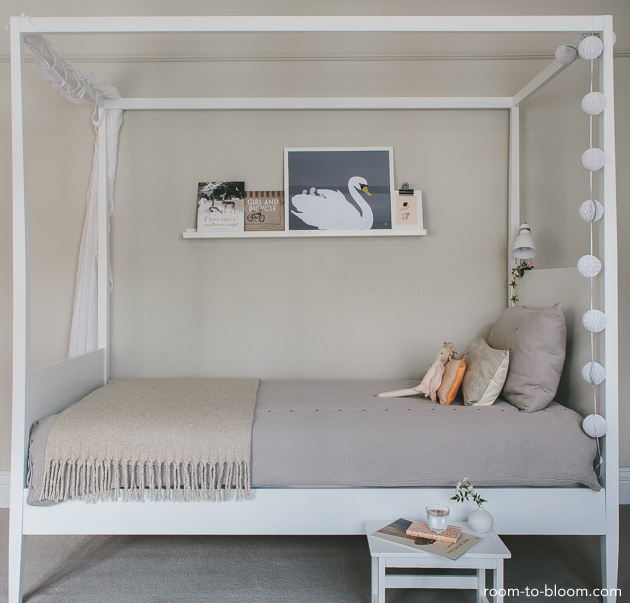 She completed the nook adding some practical items: a ledge for pictures and books, a bedside stool and a reading lamp. 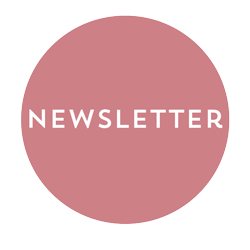 But sometimes the magic is in the little details. 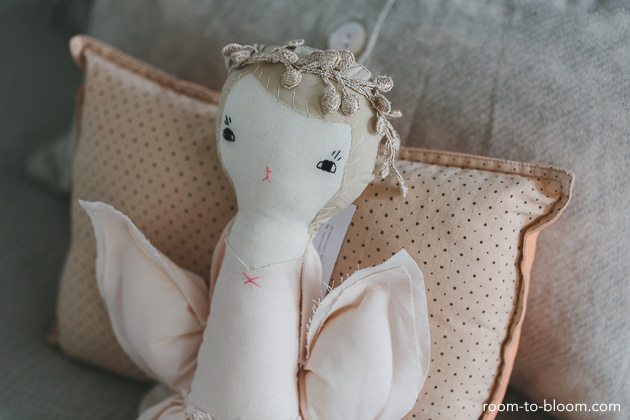 Have a look at the fairy lights, the beautiful doll or the little cushion with blush tones. 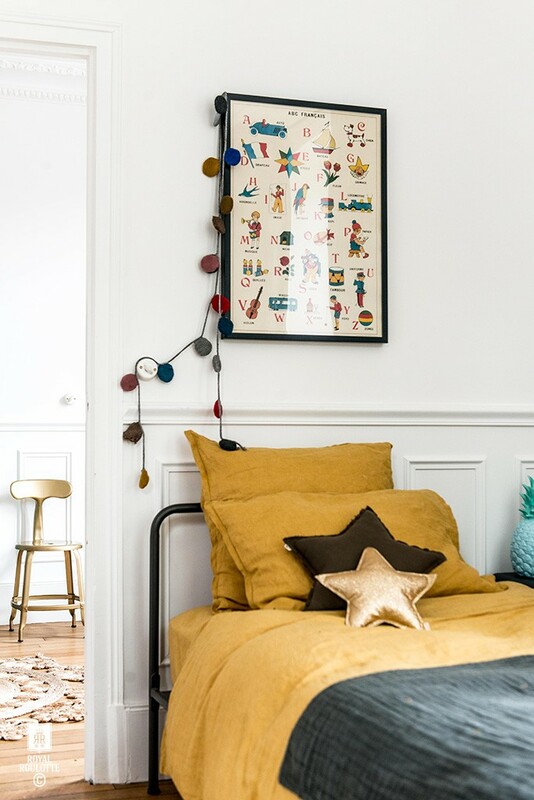 They are perfect for adding a whimsical touch to the decor of the room. 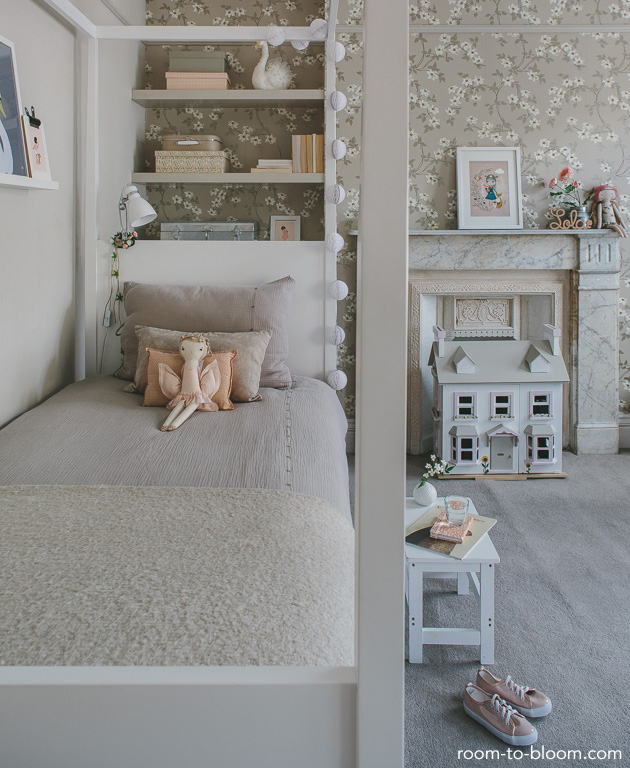 Tell me, do you like this children’s bedroom for girls in soft shades?